A Different Jesus to Believe In? When the Discovery Channel aired a TV documentary last year raising the possibility that archeologists had found the family tomb of Jesus Christ in the hills behind Jerusalem, it caused a huge backlash among Christians. The claim, after all, challenged one of the cornerstones of Christian faith  that Jesus, after his crucifixion, rose bodily to heaven in his physical form. The Lost Tomb of Jesus, made by Hollywood director James Cameron and Canadian investigative journalist Simcha Jacobovici, was shown only once on Discovery. Britain's Channel 4 canceled its own plans to air the documentary, which reexamines an archeological find from 1980 in which a crypt was found containing what were said to be the ossuaries of Joseph, Mary, Jesus, the son of Joseph, Mariamne (possibly Mary Magdalene, say the filmmakers) and Judah, son of Jesus. Given the highly explosive nature of its conclusion and its slapdash sleuthing, it was no surprise that the film was panned by some academics and many Christian clerics. Still, even after the furor over the film faded, the questions it raised about the tomb unearthed in 1980 continued to make waves among archeologists and Biblical scholars. A leading New Testament expert from Princeton Theological Seminary, Prof. James Charlesworth, was intrigued enough to organize a conference in Jerusalem this week, bringing together over 50 archeologists, statisticians and experts in DNA, ceramics and ancient languages, to give evidence as to whether or not the crypt of Christ had been found. Their task was complicated by the fact that since the tomb was opened in 1980, the bones of the various ossuaries had gone missing through a mishap of Israeli bureaucracy. Also gone were diagrams made by excavators that showed where each stone sarcophagus lay inside the tomb, and what the family relationships might have been, say, between Jesus and Mary Magdelene, who some speculate may have been his wife. After three days of fierce debate, the experts remained deeply divided. Opinion among a panel of five experts ranged from "no way" to "very possible". Charlesworth told TIME: "I have reservations, but I can't dismiss the possibility that this tomb was related to the Jesus clan." 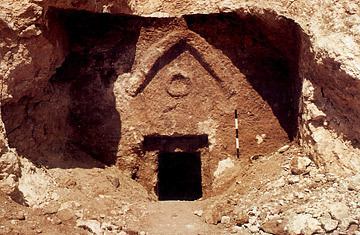 Weighing the evidence, says Charlesworth, "we can tell that this was the tomb of a Jewish family from the time of Jesus. And we know that the names on the ossuaries are expressed the correct way as 'Jesus, son of Joseph.'" But the professor has a few doubts. "The name on Jesus's ossuary was scrawled on, like graffiti. There was no ornamentation. And there should have been. After all, his followers believed he was the Son of God." There was a revelation of sorts. The widow of Joseph Gat, the chief archeologist of the 1980 excavation electrified the conference by saying: "My husband believed that this was Jesus's tomb, but because of his experiences as a Holocaust survivor, he was worried about a backlash of anti-Semitism and he didn't think he could say this." The tomb was found by construction workers digging the foundations for an apartment building in the Talpiot hills, a modern suburb of Jerusalem. Gat and two other archeologists excavated the tomb, which had been vandalized centuries earlier. The ossuaries, including one with the scrawl "Jesus, son of Joseph" were moved into an antiquities warehouse where they languished, forgotten, until a BBC film crew in 1996 dusted them off. Jacobovici took the story further, using statistics  later disputed by experts  which seemed to indicate that, although Jesus and the others were all common Jewish names during the days of the Second Temple, the chances of them all being found in the same crypt, belonging to the same family, were rare indeed. The debate over Jesus' supposed tomb will probably rage for years to come. But the conference attendees voted unanimously that the tomb, now sealed over with concrete in the garden of a suburban apartment building, should be reopened and examined more carefully. "I feel vindicated," Jacobovici told TIME. "It's moved from 'it can't be the Jesus' family tomb' to 'it could be.' "
Charlesworth, who is also a Methodist minister, says that the possible discovery of Christ's tomb will elicit mixed reactions among Christians. Most, he believes, will view it positively. The faith of some believers, he says, will be buoyed by historical proof that Christ, the son of Joseph and Mary, did exist. "I don't think it will undermine belief in the resurrection, only that Jesus rose as a spiritual body, not in the flesh." He adds: "Christianity is a strong religion, based on faith and experience, and I don't think that any discovery by archeologists will change that."